Problems and priorities about safety and security differ for a natural person. These concerns will be discussed by us, a private detective agency, in a non-binding conversation. During this intake we can make a personal ‘quick scan’ about the cases that need to be handled. As result of this scan we will present an action plan to combat these problems. If there are matrimonial twists, it often involves financial means and following certain obligations. That said, it could happen that an ex-partner needs to be investigated whether he or she is in a new relationship or not. When it has been established that the suspect is ‘living together like they are married’, then the maintenance obligation holds no ground on court of section 1:160 of Dutch civilian law. Christ & Partners has developed methods of investigation that are being applied in alimony investigations. And by approximately 85%, the results of our investigations ends with the discharge of maintenance obligation. With most cases with retrospective effect. In all of these cases , our client requested a petition where the judge defines his verdict on ground of our investigation. Are you agitated with the slow manner in which the government handles your cases? Christ & Partners has specialists in service who will take your case directly. From our experience and expertise we will stand by your side and take the necessary steps and actions. You will not have to wait any longer to deploy a search party. "Our eighteen year old son was missing. His bike was found at Central Station. Of course we immediately filed a report at the police station. After two weeks we brought in Christ & Partners. We had the notion that the police were not really paying any attention to our case. Christ & Partners started a thorough neighbourhood investigation and placed a search command to all of their contacts within the Netherlands. Within a day our son was found. He was deployed to some company by an employment agency somewhere in the Netherlands. They also recovered the temporary address of the young boy. We are very pleased with the way Christ & Partners handled our case." 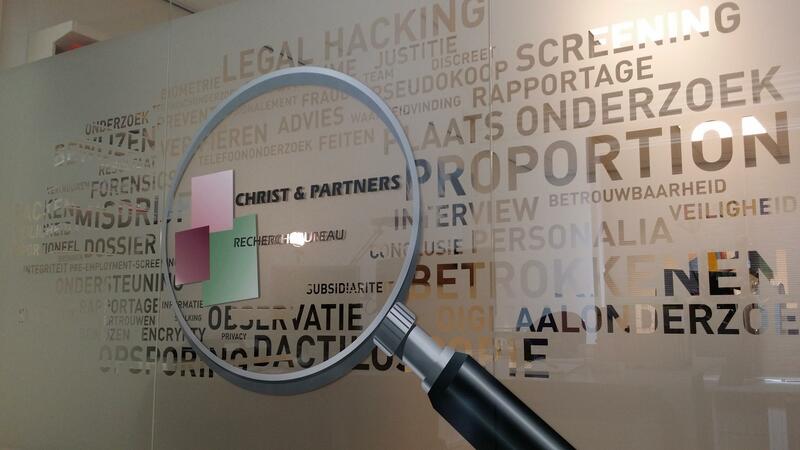 Christ & Partners comply in several private investigations. Do you not completely trust your partner? Do you want to know if someone else is involved? By means of a targeted investigation we get you your needed clarity with possible proof and photographic material. Do you want to know more? Do not hesitate to contact us or check our private detective page. Do you have trouble with people trying to blackmail you or stalk you in any way? Do not hesitate to bring in Christ & Partners to stand by your side with council and action. Because of the economical recession we see that these practises are becoming more common. However, this does not give anyone clear permission to harass you in any way. We do not only offer our support by handling the case, but we can also council you with the following judicial procedures. Are you being confronted with blackmail and intimidation. Do you want to have it solved without any involvement from the outside and any without publicity? Contact Christ & Partners directly. While you read this, somewhere in the Netherlands, a home, a car or a company is being burgled. The burglars will leave a mess, or set a fire to eliminate traces. Christ & Partners can offer you practical tips and examples to prevent burglary. These will be discussed after further introduction. A ‘quick scan’ in combination with an action plan will be the instruments that will convince your insurance company to give a premium discount. But mostly you will find it comforting to know you made the right adjustments to prevent burglary. If we are talking about the material security of certain premises, then we are talking about the constructive resilience a company is build on. That is why we gave life to a standard method we call ‘classifying’. Christ & Partners can inform you on the spot about classifying. There will be an objective view of the demands, which depend on the situation. That is why our investigation is focused on how cases relate to each other. A good alignment of measures means optimal protection and resilience on scale. Then, along with the insurance company, we will discuss if your package meet the requirements. Of course, these issues are different for every home, company, space and/or institution, which is why it cannot be standardised. Christ & Partners will investigate everything on the spot, in order to find out the optimal protection in every case. Then, along with insurers, we will analyse if your demands meet the requirements. Are you having trouble with repeatedly bad bill payers or defaulters? Christ & Partners takes action: fast, effective, and within the boundaries of the law. "Mr. X refuses to pay his ex-wife alimony. He moves abroad and ends his conduct of business in a cunning way. The lawyer of his ex-wife starts a legal procedure against him. After three years, the court rules in favour of the ex-wife, and X has to pay her €125.000. In the verdict, the court states that X can be held hostage by the department of justice for fourteen months. An enforcement officer will help the wife to execute the verdict. In consultation with the wife, the enforcement officer asks Christ & Partners to help. Research has shown that X is renting a home in a Dutch holiday park. Neighbours tell us that X stays at this address every last week of the month. The enforcement officer asks the police to reserve a cell. Christ & Partners observes the house during the last week of the month. We inform the police and the enforcement officer at all times of the position of X. After two days, they drag him from his bed at 4.30 in the morning. X goes to jail for a few hours and at 10.30, he transfers the outstanding amount, extra costs inclusive, by telephone, from his account abroad to the account of the enforcement officer." Would you like more information about our private detective agency?